DeKalb County is invited to help Aaron Tippin show your support for American Troops. Stop by Aaron Tippin Firearms before November 22nd to sign the banners Aaron and his band are taking on their USO Tour while overseas entertaining our American Troops. 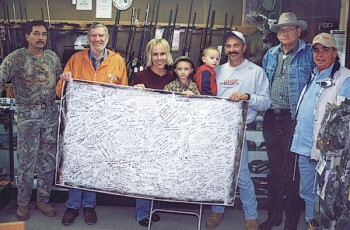 Pictured with a banner are Sparky Bedoy, Malcolm Lee, Thea and Teddy Tippin, Thomas and Aaron Tippin, Ben Herman and Robert (Smitty) Smith. (Chris Tramel photo).